Buck Rizvi is a co-founder and partner in a business that’s been making eight figures year after year after year. 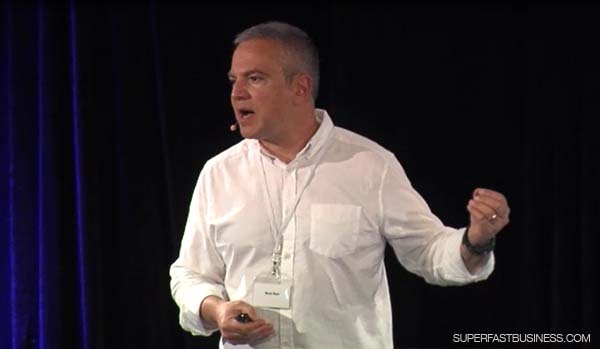 In this preview of his SuperFastBusiness presentation, he reveals the principles that sustain the business and account for its phenomenal success. 06:28 – Do you have the right soul? 17:43 – Who are your products for? James: Our next guest is Buck Rizvi. I first met Buck when I still had a job. This was quite some time ago now. It’s probably about seven years ago. I had flown over to Los Angeles. I attended Underground Online number 4. I applied for a competition. I stayed up all night. I didn’t go to bed, didn’t sleep. I stayed up all night, submitted my competition entry and I won. Out of the 350 or 450 people that were there, I won the prize, which was to join the Maverick Mastermind of multi-millionaires. Since I still had a job, I kind of felt way out of my depth. So if you are brand-new and you feel out of your depth here, don’t worry, that’s normal. Going to events is life-changing. So, I went to the mastermind at Las Vegas we did all sorts of things, from air combat, to zero gravity. One of the people there was Buck. Buck back then and still now runs a significant business. He’s doing 8 figures a year. I like to bring someone here who’s doing business at a scale at the top end so you can see where it can go to. Hopefully, there’ll be some commonality between what we’re doing and what they’re doing, and you’ll see some things that you can apply in your business. Buck’s a very generous and knowledgeable person. He’s also going to hanging around for the whole event just outside the room. If you’re interested in what he’s talking about, go and see him and ask him about it. I’d love to welcome Buck Rizvi up to the platform. Come over here Buck. Big round of applause. All the way from the big US of A.
James: Thank you. All right. Buck: Wow. How’s everybody doing? First, thank goodness it’s just the tea that you had and not the lunch. I feel sorry for the guy that’s speaking after lunch. I do not speak. Generally, I just had my first live event a couple of weeks ago. Actually, quite a few Australians were at my event in Boulder, Colorado. 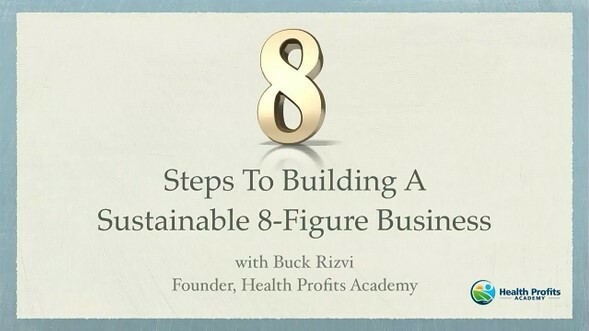 So my day-to-day thing is I run a dietary supplement company with a couple of other business partners but we’re here to talk about, I call it the 8, I have a golden 8 there, 8 steps to building a sustainable 8-figure business. I’m very fortunate and very grateful to have the opportunity to have a business that has such an impact on a large number of people. In fact, well I’ll get into that in just a moment; it’s very emotional for me. A little background about me. 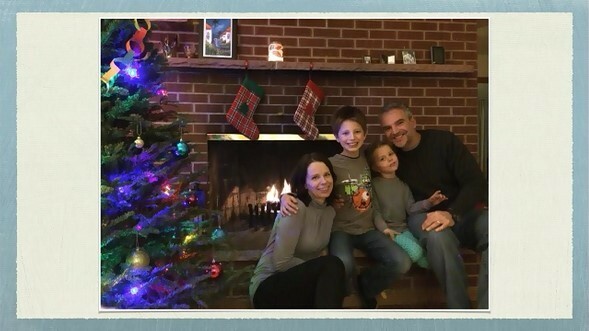 I’m a family man. I’ve got 4 kids. These are my 2 youngest kids from a recent Christmas photo pic here. That’s Emma, 5. Lucas is 12, and my wife Daiva. 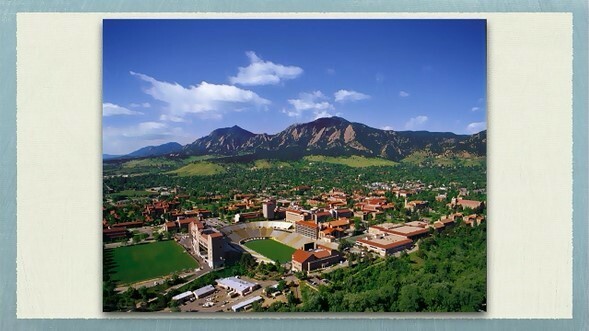 I live in beautiful Boulder Colorado. It’s ski season right now. I was actually skiing a couple of days ago. I’m getting a number of firsts actually. Australia has been a contributor to a number of firsts for me. I first learned how to scuba dive here 20 years ago, and I now, thanks to James, had my first surf lesson yesterday on Manly beach. So thank you James. Appreciate that. So anyway, that was wonderful. I had an amazing time. I’m also cofounder of RealDoseNutrition. 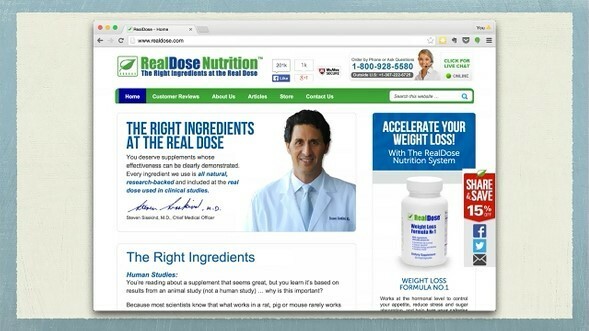 RealDoseNutrition is the 8-figure business that James referred to. We have been doing 8 figures actually for well over 3 years now. I am really, really fortunate to be a part of this company and to have had such an impact on so many people’s lives. In fact, thousands of Australians have been impacted by RealDoseNutrition. We ship worldwide from the US, and just recently, within the last 2 or 3 months, we got a notification that we had just served our 300,000th customer worldwide. Really big deal, the reach that you can have with your online business. Just think of the humble beginnings that I started with when I first got into this arena maybe 8 years ago. So I’m very, very proud about that. 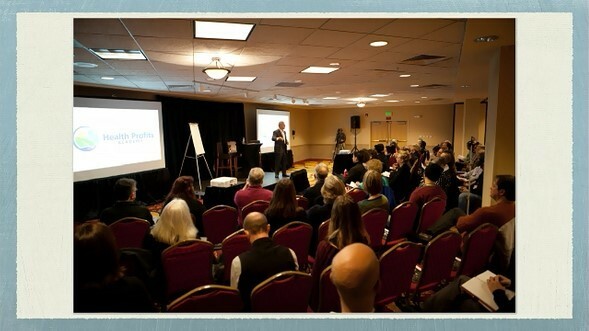 I’m also the founder of HealthProfitsAcademy. This is fairly recent and there are a number of reasons why I’m doing this. If you want to come out and talk to me, I can share some more details about this but I help entrepreneurs get into the health information and health dietary supplement business the right way, what I call the ethical way of promoting health products online and the kind of impact that you can have with that business. So this is a picture of me on a different stage the last time, last month actually or 2 months ago. Educating my students about how to do this correctly, and we had a few Australians in the room as well, and that was in Boulder. 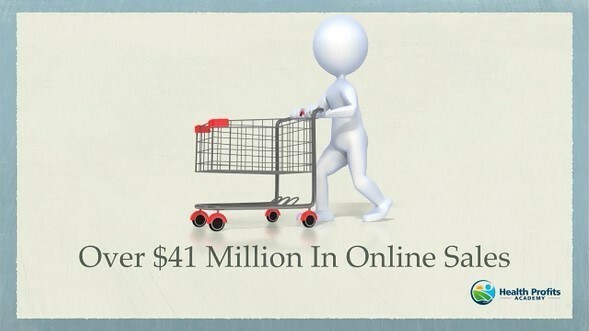 My business has generated over $41 million in sales in the last 6 years. So I’m really excited about that, and again the impact that that can have. But the reason why you’re here is because I might have a few things to share on the topic. So let me get into it because there are a few things we want to cover. I want to make sure that we do it all justice. So I’ve got these 8 steps that I’m going to be going through. Some of these things you may have heard before. Some of these things I’ve kind of learned along the way in architecting this business and putting it together in what I call the ethical way. And step 1 is what I call making sure that you have the right soul for your business. This is not a ninja trick, but this is something that has served us very well and it enabled us to weather many storms in our business. Having an 8-figure business is not all peaches and cream. A number of things can happen especially when you’re promoting products online. Sometimes, advertising networks. Have you ever heard of Google or Facebook? Anyone been slapped by Google? No one’s been slapped by Google? God you guys are great! That’s awesome. I was slapped by Facebook, I was slapped by Google. Mike knows what I’m talking about. But something that we started out with, actually relatively early in the life cycle of RealDoseNutrition, we’re now in our fourth year, is that we decided to really sit down and think about what’s important to us. What’s important to us as a business, how do we want to serve our customers, how do we want to treat each other, what are the tests that we want to subject ourselves to as we grow our business? And so yeah we came up with a mission statement, that was something that a lot of people talk about but we decided to document our core values. And we decided, these are just a few of them but some examples are embrace an attitude of service, be empathetic to our customers, be kind, be humble. Anyone read the book “Delivering Happiness?” I’m going to talk about that in a minute, but “Delivering Happiness” by Tony Hsieh of Zappos. 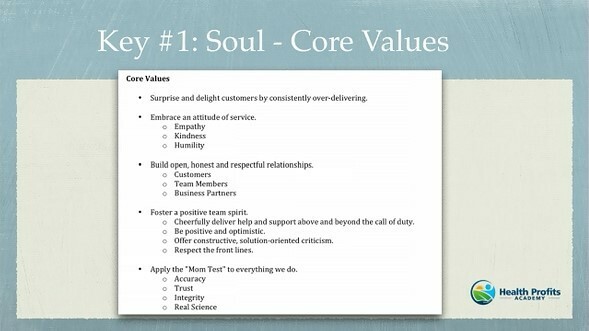 If you’ve read that book, you’ll see there are some similarities to the core values they talk about there. Building open, honest and respectful relationships. If you can see that in the back if the room, I have aging eyes, to our customers, our team members, our business partners, having a great team spirit. I’m sure James, with the people; I think you mentioned to me there are 46 folks, the ninja pinos in the Philippines. For him to have a half a dozen managers managing that number of people, there has to be some team spirit. People have to be excited about working for your company and that’s going to show through to your customers. 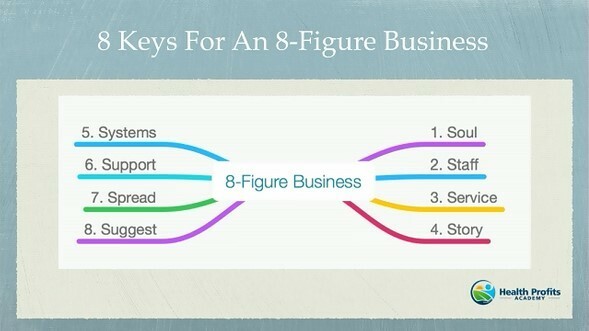 If you want to have a 7 or 8-figure business and have it sustain, these are very, very important things to focus on. I’m very proud to say that most of our employees stay with us for the long term. I have employees that have been with me for 8 years. Occasionally, we’ve had to let people go, but by and large, they remain with us because they love what we’re about. It’s not just about how much money we can make. I feel like I’m making a difference. Actually, one of the speakers at my event, Jenny Thompson, CEO of NewMarketHealth, which is a division of Agora, she said that you have something called the grandmother test, we call it the mom test. So everything that we do, whether it’s a business practice, whether it’s the ingredients that go into our formulation, how we go about delivering our message, we ask ourselves, Would we allow our mothers to receive this message, to ingest this product? Would we be proud about that, our mothers, our sisters, our brothers? Whoever that is, it’s our mom test. So everything has to be backed by Science. It has to be accurate, what we say. We want people to trust us because we have the integrity and I think you can apply that to any business, not just to a health business. I have many more of these. If you want to come by at the table later, I’ll figure out a way to get you guys a copy of the core values or at least go read “Delivering Happiness” by Tony Hsieh. So speaking of which, that book and the website Zappos, they were purchased by Amazon.com. Great example of how to run a business, how to treat customers. I’m going to talk more about this later but that’s part of what I call the soul, step one. Step 2 and I’m sure James has reiterated this many times, but you’re not going to have a 7 or 8-figure business if you don’t have a team. And there are a number of things that you want to execute in order to build that team, and also to have them working excitedly with passion for you and when they communicate to your customers, or when they build your next campaign. A number of things that I’ve found, that I’ve done and that we’ve done as a team to create that team spirit, to have people excited. Number one, when I’m hiring anybody, I always use what I call, you know the story of the frog and the princess, the prince frog, I don’t know what the story is called, but the princess kisses frogs to find her prince, so I call it the frog-kissing method. And so the frog-kissing method is I always have at least 3 candidates for any position that I’m vying for. I’ll show you an example of a job post that we put out. I’ll have them run through a gauntlet of things and often they don’t know why they’re going through these things but I make them do it. For example, I found a star lady, Anna Kovalska, to run my event that she ran the event for me single-handedly. I found her on craigslist. But I had to go through a process where she had to leave a message on a voicemail, tell me what her qualifications were, why she was excited, why she thought she should be hired for this position. I had her put together a PDF document with her CV and email it to me. So all these steps that I had her go through, I wanted to make sure she paid attention to detail, that she sounded excited and passionate on the phone, and a number of other things. So that was my test. And a lot of people just self-selected out because they didn’t pay attention. But I found a couple that rose to the top and I hired on and now she’s actually helping and supporting me on other aspects of my business. So it’s a great way to find, but make sure you have a number of people you’re doing this with, no matter what the role is, customer care, media buying, or some other senior marketing position in your company. James, I think he said he had 6 managers, at least have a dozen managers that are managing your team. If you don’t have managers, how are you going to be able to step away and go surfing like James does? So I like to go to the range, I’m a gun nut. I guess you can’t own guns here in Australia so I shouldn’t say that. So I like to go shooting at the range, I like to go skiing, a number of other things. We’re getting into camping and some self-reliance things. So that’s fun for me. But in order to do that, I have to have managers because I’m here in Australia speaking to you, they can run the business that I trust to do that. 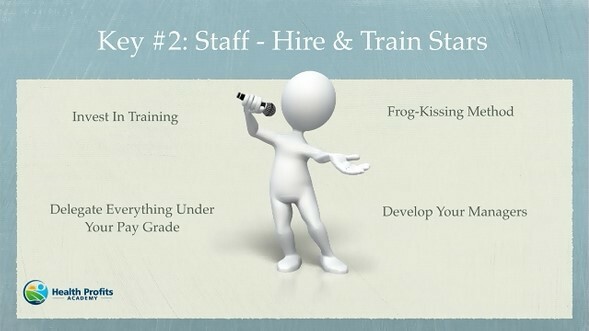 So developing those hires into the managers of your business, and part of that is investing in training. So for example, have you guys heard of agile development? Are you guys familiar with that? How many people are using agile development or scrum in their business? Other than the speakers? Nobody. Okay. Interesting. So I had my virtual assistant recently, just flew him to another country to go attend a few days training. That’s $1000 investment for me, and this is a virtual assistant that I’m paying less than $1000 a month for. But I still invested. He asked me, “Hey, I’m interested in taking this training, this sort of train the trainer course. I want to be the scrum master of this group.” I’m like, “Hey, I’m all for that.” So I just flew him over into that training class and now he’s going to be our scrum master for our team, for HealthProfitsAcademy. So making those investments, thinking ahead so that when you’re positioning yourself to have a manager that can run things for you. And I think you guys have heard this, delegate everything under your pay grade. Bill your time to your company as if, I think of myself as you know, $2000 or $3000 an hour. Whatever your number is, that’s what you bill your time to your company. So if it’s something that’s not worth that time, go ahead and delegate that. Figure out how to delegate it to someone else. Document the procedure, hand it off. So this is the ad that I used to hire my star customer care agent. She actually joined me in customer care, and again, I mentioned a lot of our employees don’t leave the company. She’s been with me now I think 5 years. Hired her on a craigslist ad, advertising in the Midwest United States. That’s not the full ad by the way, so I apologize for that. But if you’re advertising for your position, don’t think of your ad as being like, “Oh man, I’m just going to say, I want a customer care rep and they have to be available at this time and date and blah blah blah blah.” Boring. 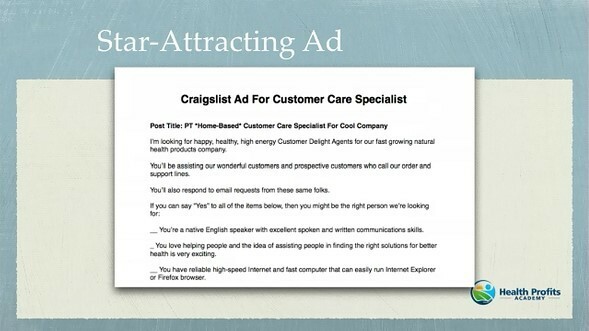 Write your ad like you’re writing ad copy. You want to attract the star. Why would you have your ad be boring? So I always sit down and put myself in the frame of mind like I want an ad that I would like to apply for that job. Exciting. Health company, on the move, 300,000 customers, constantly rolling out new products, we’re changing the world, we’re impacting lives. Would you like to come and help support some of our customers? Here are the things that I think, I’m paraphrasing here, but here are some of the things that I think you should have if you want this position. So I’m selling the position, then describing what I would like them to have in terms of qualifications, then I’m selling the position. The love sandwich there. So this was very successful for me and now she actually has a personal fitness background. She’s a stay-at-home mom. She’s able to work from home and now she’s running an entire customer care department from that one craigslist ad. I forgot how much, I think some ads are, the gig ads are free. I forgot even if I paid for this ad to go out there and found such a star. So let me move onto this next topic. The subject is service, the other key of building an 8-figure business is service. Who are you serving? I put this up. Anyone knows what this is, this board is? It’s your dream board. How many have heard of dream boards? How many might have a dream board? Okay. 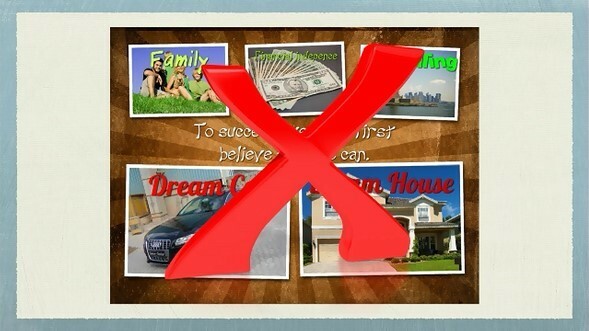 So the big red x is there because when you’re talking about building an 8-figure business, it’s OK to think about what you want. All right. It’s fine. Say I want to have a fancy car, I want to take vacations, I want to be able to travel the world, I want to have the beautiful house, I want to have plenty of money to burn. So that’s great. but what I found is that that inward focus does not serve me very well. It does not serve my business very well. So by focusing on what it is, the outcome, whether it’s in my RealDoseNutrition or with my HealthProfitsCoaching, by focusing on what my customers are trying to achieve, what their goals are, what’s important for them, again I go back to think about the mom test. I’m able to be much more successful. That’s served me very well. So the next is service. When you’re talking about service, you’re talking about who it is that you want your products to be delivered to, making sure that now we decided to serve women over the age of 45 that are looking to lose weight, for example. That’s who we wanted to serve. And so we spent a lot of time thinking about that market, talking to women, talking to our moms, our sisters and other people that we trusted, and we realized that this was a big problem. So we knew, we did our homework, we realized that this is a very large market, it’s accessible market, and we felt, because we had expertise in the health space, and we could formulate products and provide services to go with them, that we could truly help that market. So it was something that again, thinking about them, not about us. Everyone knows they should take a multivitamin. Probably should take fish oil. But how many do it every single day? I do but not everyone does. My dad has a joint problem. He’s having some knee surgery or some other issue. 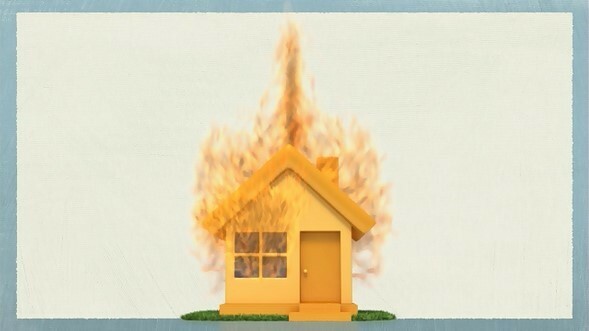 That’s a house is on fire problem that I want to address. So a very important takeaway in this and especially for going after a larger business that can scale. Here’s a great example of someone right in the sweet spot of our market that we’ve been able to serve. 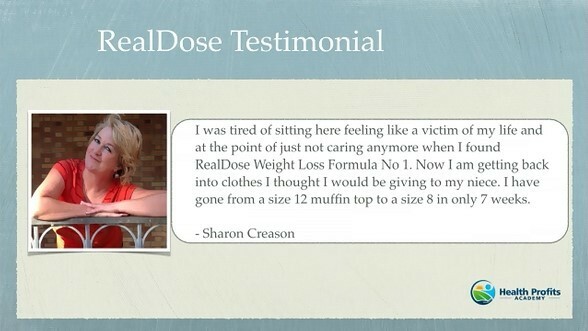 I love this because when we get these testimonials unsolicited from customers, and by the way, Sharon is 60. When we get these testimonials from unsolicited customers, we take them, we read them in our huddles that we have. We have standup meetings and we read them out loud, and we share them, and we are thankful and we have gratitude over the fact that we have the success. And it feeds back into the business. It feeds back into how our customer care reps are motivated and how they want to communicate then with the customer. It’s a self-reinforcing process. I could not make this up. This is her language so I apologize if I’m offending anybody with this testimonial. This is her language. It’s how some women maybe in America might think about problems that they have. So the next key in building a successful sustainable 8-figure business is, and I think this was mentioned earlier, is telling the story. 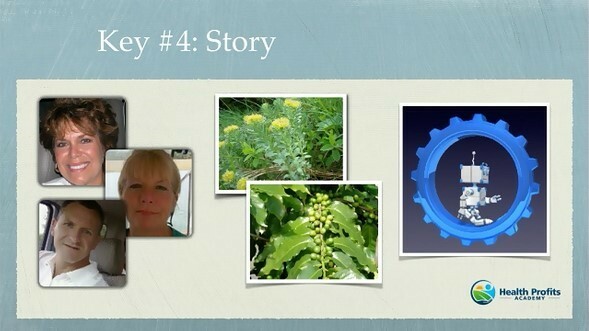 I like to do it in one of three key ways when I’m telling my story, especially when it comes to health products. One way is your customers as heroes. And you have to be a little careful with that about that in the health business because I don’t know how it works for the TGA here, but in the US, we have a couple of three letter alphabet soup agencies, FDA, Food and Drug, and we have the FTC, Federal Trade Commission. FTC is kind of the bulldog for the FDA. You can’t just publish testimonials from customers unedited and use them as substantiation for your product, unfortunately. They might’ve lost 100 pounds, they might’ve lost it in 3 months, all that maybe true but you can’t just put that up on your website. But there are ways that you can take testimonials and use them correctly in a compliant way and herald your customers as your hero in your marketing and you should do that because how many of us go and look at reviews before we buy a product? How many don’t look at reviews? So we all do, right? We go to Amazon.com or whatever your favorite website is. We go look, read the reviews, we want to hear what the customers have to say, more so, most often, than what the companies have to say. Those middle graphics are ingredients. And it doesn’t matter if you’re selling health products, or you’re selling marketing, or something else, but your ingredients can be heroes. So we have some pretty cool Ayurvedic ingredients in our weight-loss formula. We’ve got a product, we’ve got green coffee extract for example in one of our products. We talk about how those ingredients are different, where they’re sourced from, how they’re processed; we have a number of things that we go into in the storytelling, raising the ingredients, what’s inside as the hero, okay. So that’s another way to incorporate that into your story.